It seems that the Prussians will soon be as well catered for as the British and French in 28mm Napoleonic plastics, with the Perry miniatures that are now on pre-order being the third set available; Warlord and Hat Industries having already entered the fray. Such information as I have came from their website: HERE. 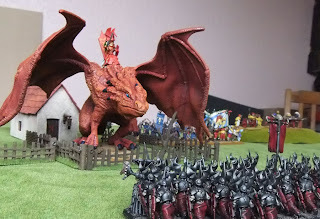 Kings of War - Historical? 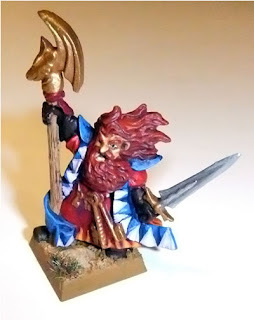 This website has a set of adaptions of the Mantic Kings of War rules to cover ancient wargaming; this year is going to be the year of a successor to Warhammer Ancients, and having the advantage of being fast to play and free to acquire, these may have a chance as that successor. 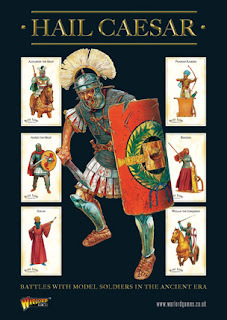 That said, they only cover Rome versus 'The Barbarians' at present and I haven't yet tried them. 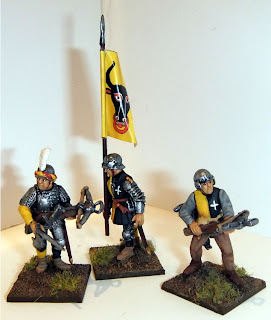 #still these plus a copy of KoW would make for a simple and accessible introduction to ancient gaming for the otherwise Fantasy enthused set. Assuming you've managed to draw them away from Warhammer Fantasy in the first place! 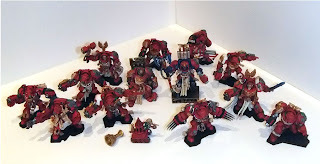 A personal update more than anything, and I do try to keep these to a minimum on the blog. Normal service will be resumed shortly, but yesterday I received the exciting news that my apartment block had been selected to be condemned! On the ground of being the sort of glossily finished fire hazard more normally found in Bulgarian Ski resorts, or rush-job Shang-Hai office blocks! Apparently it's a death trap. So today I move house, to as yet I know not where; aside from the normal ephemera of home life, this will also mean shifting the mountain of lead and plastic once again, which at least is usually an opportune moment for a clear out and to blow the dust off a few cherished items. 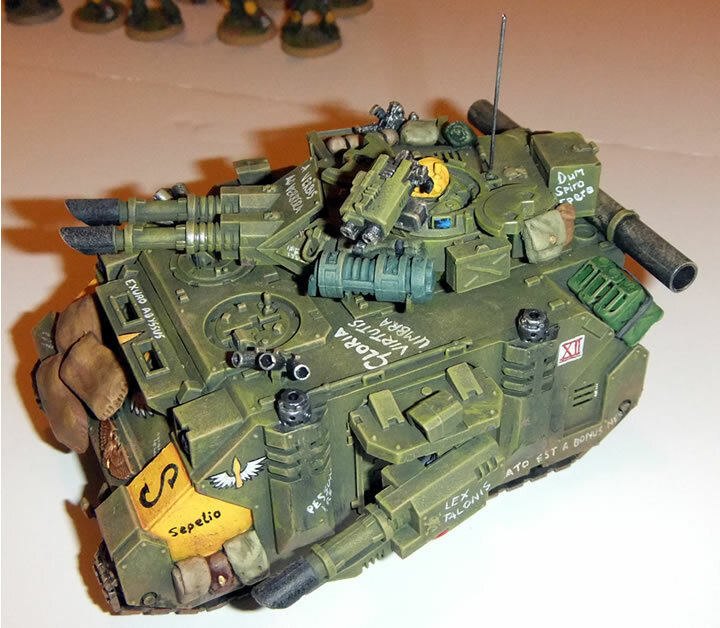 A cash injection to the wargames fund is long overdue, not least as the last such injection ended up being spent on a car, pointlessly as it turned out. Still, to eBay with them, they're available HERE. 12 men from the canton of Uri. 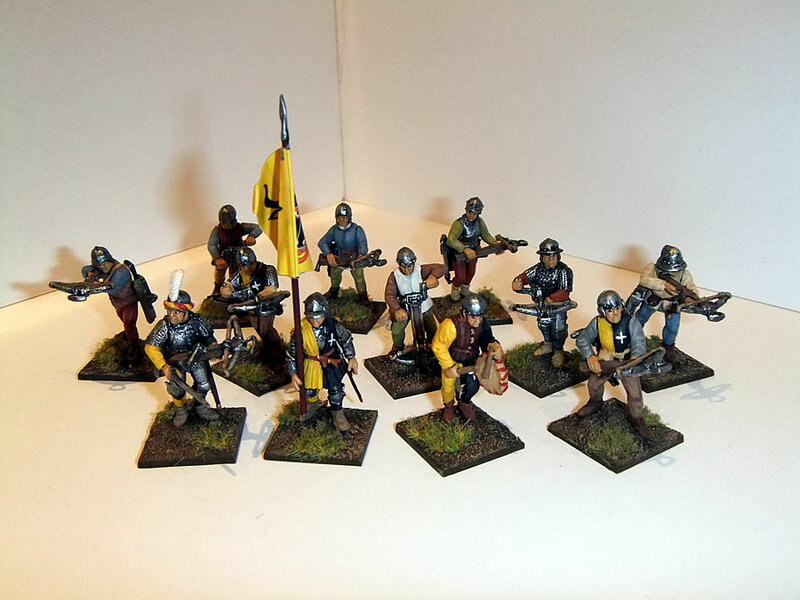 As recommended by the pamphlet in the Perry set, the command, and a couple of the infantry are liveried, in a distinctive black and yellow combination, but most of the troops are not. 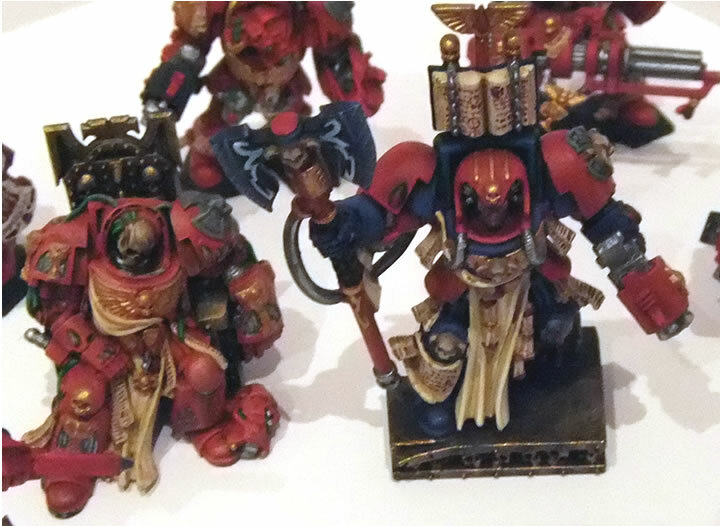 I did some light conversion to make a more appropriate commander for the unit. Both these sales are active now so get bidding if you fancy what I'm offering! It's not all for sale though, I knocked out a few oddments of scenery in the last couple of weeks, not really worth pictures though. And I also added to my growing collection of Goblin Bosses with this chap. 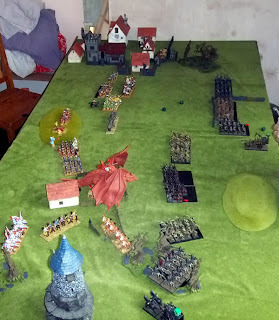 Ok, so a thin explanation for a game of Warhammer, my first in over a year. 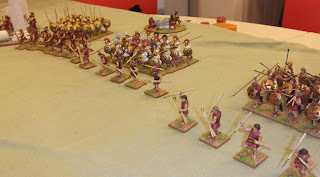 Martin used to circulate on the tourney scene with his Romans and I have of course a Spartiate Greek army to play with, and so we made for a 1500 game. Initial deployments were as can be seen. Martin's Roman army was surprisingly small, suggesting tooled up super elites. 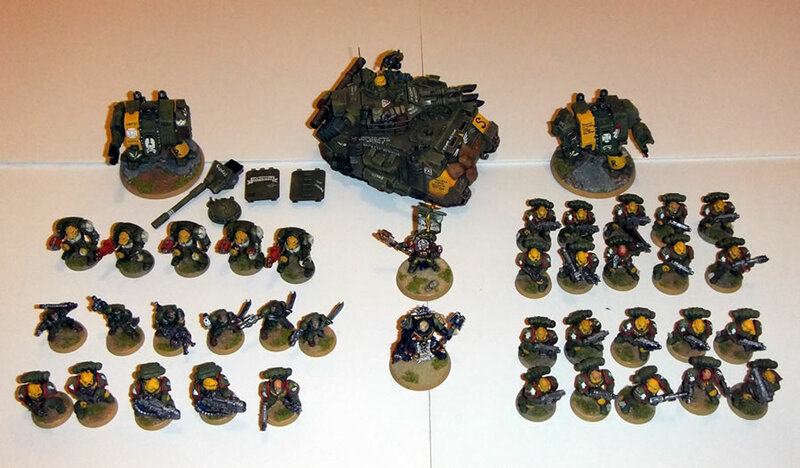 Mine flattered numerically with lots of dirt cheap skirmishers to support the three Phalanxes. 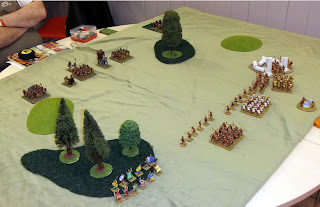 The Greeks won the first turn and set off on an over hasty advance, our nimble skirmishers and light troops formed an effective screen; but as the Romans had no end of javelins they were able to stave the Psoloi off with ease. 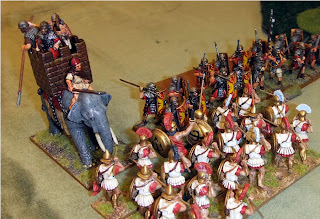 The Phalanxes trundled along behind. Having cleared away our lightest troops and having used his cavalry to distract my bowmen and to a lesser extent the Spartan Phalanx, the main City Phalanxes got stuck in to the Roman centre. 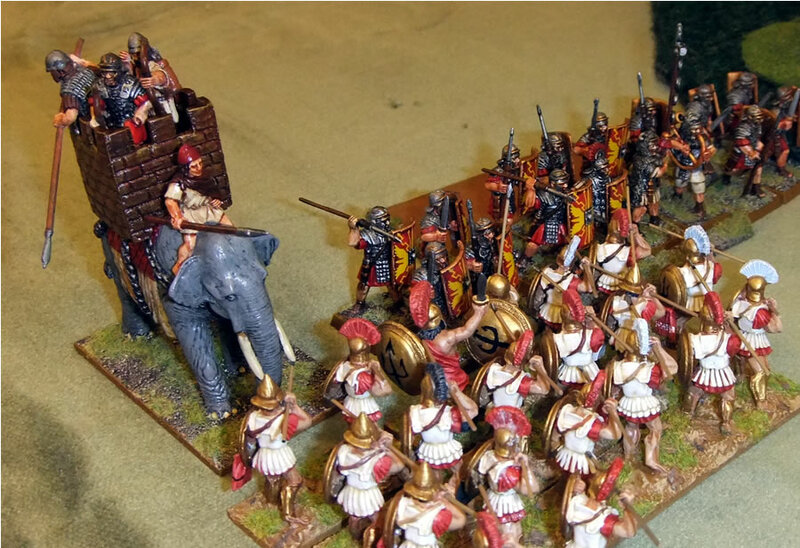 The Messinian phalanx did a steady job of destroying a Roman cohort, whilst the Chalcidians initially collided with another. Then the big grey tent arrived and made merry hell, terrifying the Chalcidians! 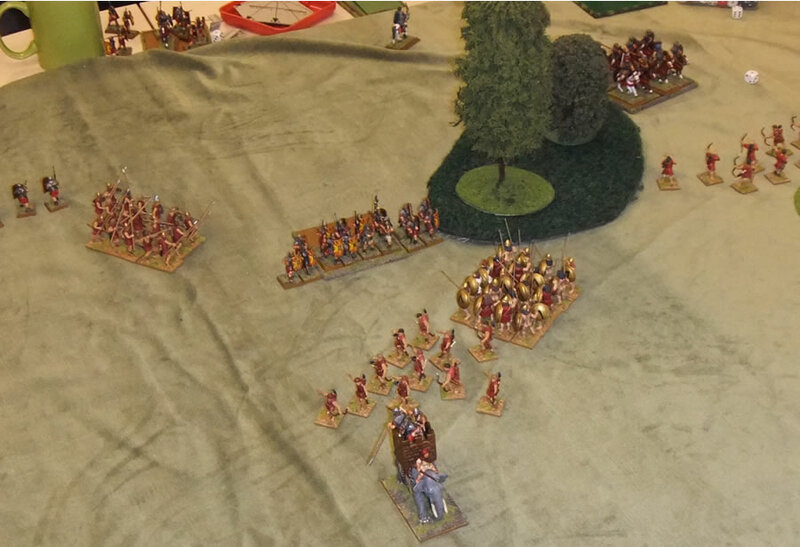 By this point though the Messininans were busy taking the Legions Eagle and chasing its' general from the field. My bowmen encircled the pursuing Elephant whilst the Spartans went in for a quick round against the Romans, routing them immediately, only to see them rally. Before this a wound on the Elephant would see it go berserk. 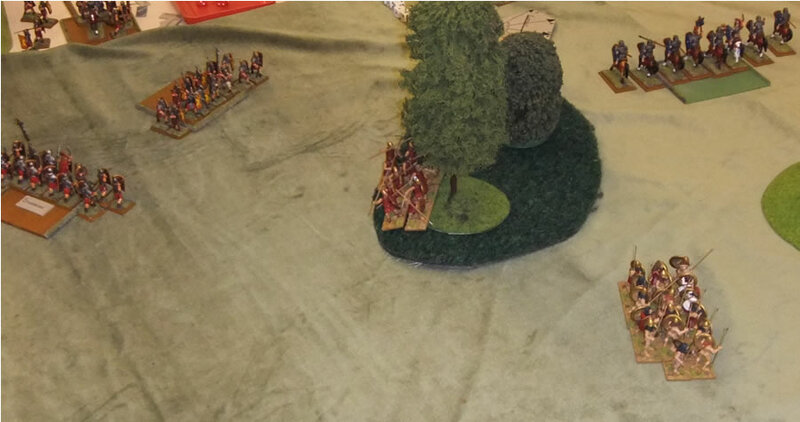 It scared my bowmen away too, but also chased it's own cohorts almost off the field, forcing Martin to turn his Ballista on it to avoid even greater loss of his own men! By the end, I was a much reduced force, but with my general, all but a couple of his Spartans and most of the Messinians still alive, I was comfortable victor. A case of putting all your eggs in one basket working out, with over 700 of my 1500 points being in the Spartan unit and the Messinians being worth 250, I lost scant more than a third of my army, compared to half of Martins and two captured standards and an Eagle too. It was nice to get the ancients out again, but I was conscious of how such a small game took a long time to play to a conclusion (3 hours). 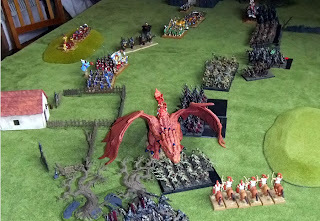 Warhammer Ancients has always felt like a small, almost skirmish level battle; I've never had the time to play great clashes with it. Maybe new rules will fit the bill, or perhaps I will have to try the likes of Impetus or get back to Armati. Now, their not my best work, but they were finished in a haze of flu, and after hanging around since before Xmas, I'm glad to see the back of them. 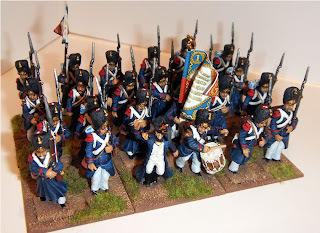 This brings me up to a full, if rather mixed, French Brigade of 4 Battalions. 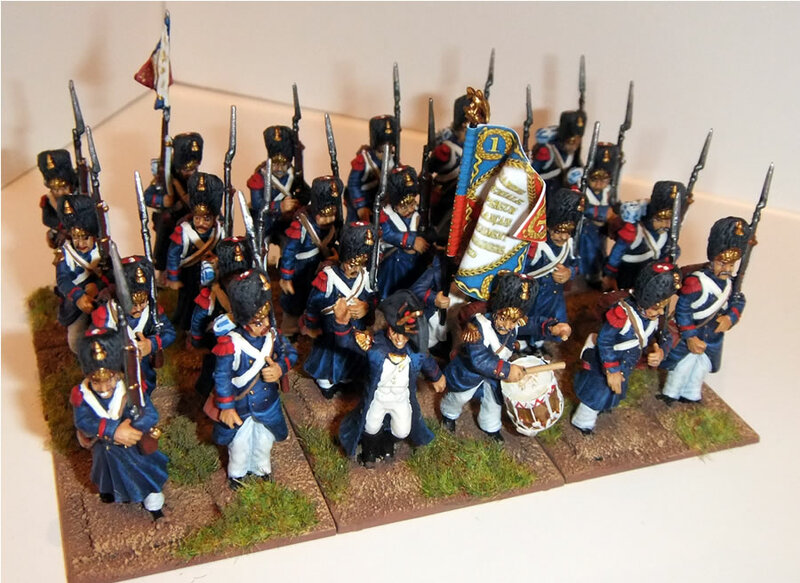 Next for the French is some cavalry though. 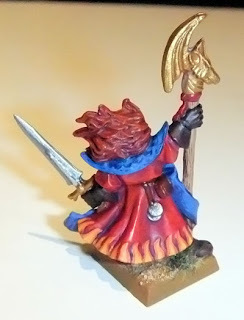 One of the original Games Workshop Battle Wizards, that went out randomly on a copy of White Dwarf aeon's ago! I picked this chap up for a mighty 25p at the York show. Glad to clear some of the backlog away, moving on to earning jobs for a few weeks! Having just enough models ready (or nearly finished) for a game I arranged an opportunity to learn the rules with Neil from the club who is an avid enthusiast of the game and glad to get his models on the table. 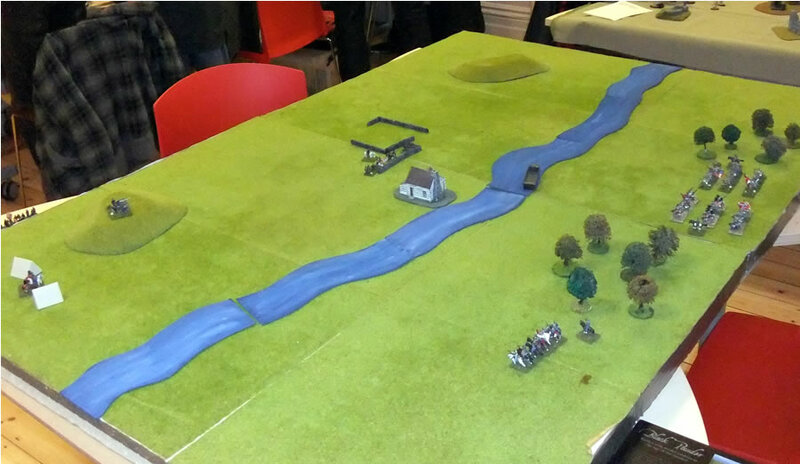 We set up a simple battlefield with a variety of terrain but some open ground in the centre. 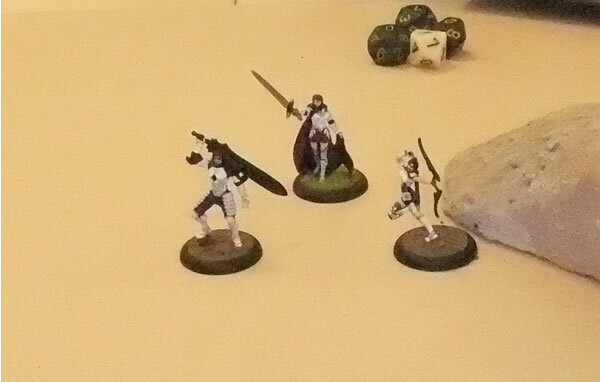 My force was my Black Sun models: Promethea and Styx, a Type 005 Assault Model and Sophia Ilmora as a wanderer. Neil was using an Empire force of Lilian Virgil, Janus Faith and Daniella Meris. You will obviously notice that those are both tiny forces, a total of seven models. foremost, Anima Tactics is a character driven skirmish game. So how does it work? Well, AT is a activation based game, where each player alternates carrying out all the actions for a single model in their force. 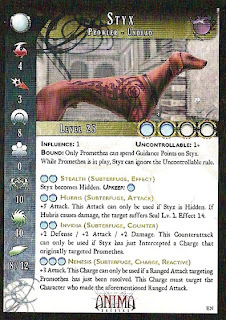 The permissable actions include the usual, moving shooting and so on; but as can be seen on the sample card below, each model also has a number of unique actions it can carry out as well. There is a cap on how much a model can do, no model can take more than five actions in one turn, and because models recuperate actions at a rate of between nought and three per turn naturally they will tend to have some quieter phases if they are very active. In the game I led with the Type 005 to try and draw first blood. Being optimised for combat he was one on one a threat to any of Neil's characters, however he found himself outnumbered. Combat is handled through D10, with a player adding their Attack stat to the roll and deducting the Defence stat of the opponent. 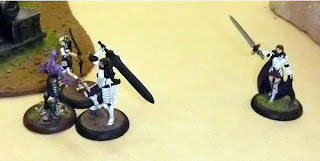 If the opponent has an action spare (even if they have been activated already that turn) they may dodge, rolling their own D10 to add to their defense. If the difference in the results is in the attackers favour it's a hit and their damage rating, less the opponents armour rating is added to the result to indicate the number of Life Points lost. In practice a very simple system to use, both Attack and Defense can be 'buffed by special actions - Sophia Ilmora proved very effective at this, and forces have access to Gnosis, essentially extra D10 they can choose to roll for key tests, to allow them to pick the best result. 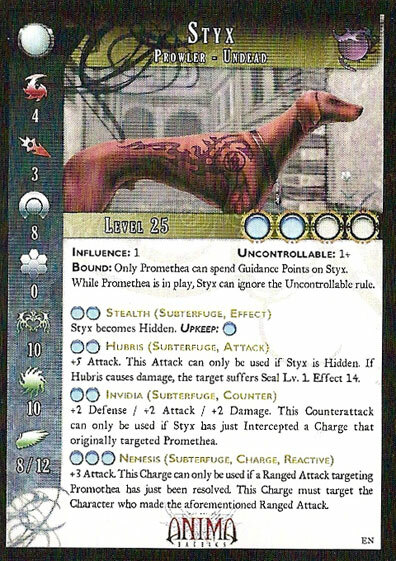 Anyway, my Type 005 died, and so Styx was sent to protect Promethea; he did a good job of this, near crippling Janus before being ganged up on and killed. Promethea now used one of her magic effects to fatal effect on Lilian. Magic is handled by what are called States, they cast automatically with the expenditure of action points and it is up to the target to resist. Models have a resistance level, for example Lilians was 10, and they add this to a D10 roll against the strength of the effect to try to resist the spell. 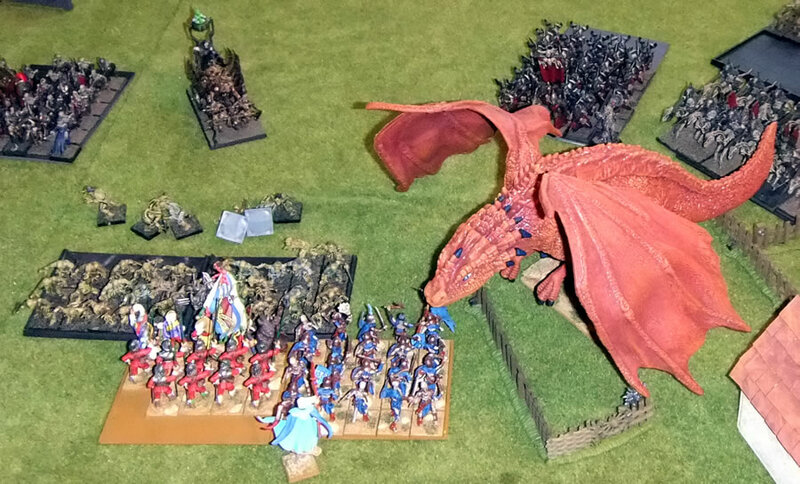 Lilian failed to make the target of 15 and so was effected by 'Doom' for the next two turns. On it's first turn she rolled a D10 hoping for a 6 or less, but instead got a 7 and withered away. It proved roo little too late though for Black Sun. Promethea and Sophia are both lightweights in combat, whereas Daniella was easily capable of beating them both. When Promethea was killed off, I had Sophia wisely surrender. So, is it any good? Well, yes actually, I think it is a really nice game. There is a deep meta game here in finding the most effective team builds as well as a simple but subtle tabletop system. I'm glad I was sucked in by the pretty models, as this seems to be a game with lots of potential. 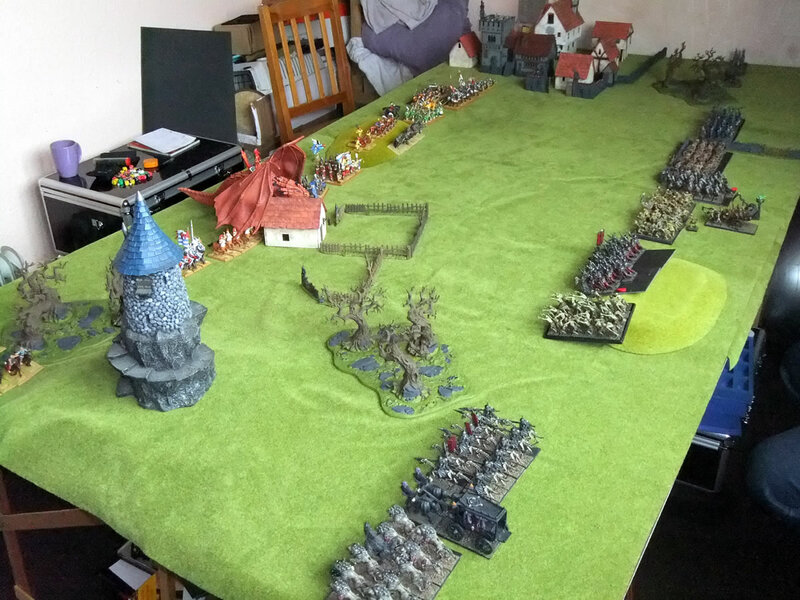 Whilst the Sunday club is offline, I arranged a game with Jason at his house. Having the luxury of more space and time, we opted for a bigger game of 4,000 points; my Dogs of War versus his Vampire Counts. Jason opted for lots of Hordes, backed up by big blocks of Black Knights, Dire Wolves, a Varghulf and a Black Coach. There were a total of 5 Vampires! 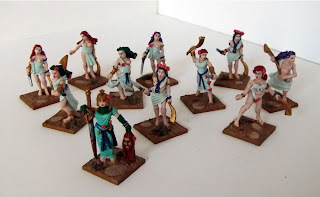 For my part, around a core of old favourites I added Asarnil, Lucretia Belladonna, a second unit of Knights and the return of Ogres. I used a lot of tooled up heroes, both to thicken out points, and as anti tank units for his super-elites and spectral forces. The aim early on was to control the flanks, as ever for my Dogs. 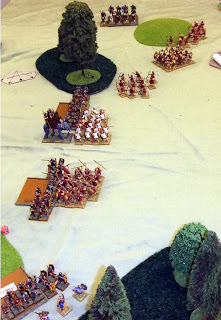 I can generally out manoeuvre Jason, and with three light horse units and two flyers there was every chance of doing this. My General ended up running intercepts in the northern portion of the battlefield, around the village; whilst a pell-mell action of movement formed in the south. 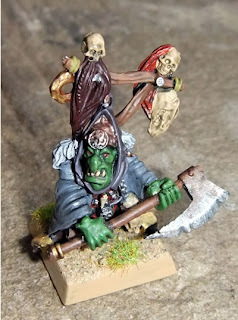 Deviously the charge was directed against a small unit of Zombies, in an attempt to collapse his entire flank. 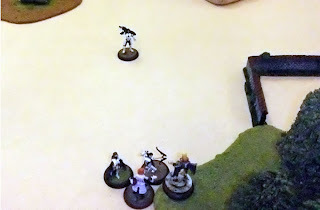 Sadly Asarnil himself got killed (in fairness Belladonna's "gift" at the start of the game had back-fired and left him on one hit already...) But Deathfang went into an uncontrolled rage as a result, and, barring one failed morale test, fought far better without him. Deathfang was steadily smashing it's way through the Black Knights. 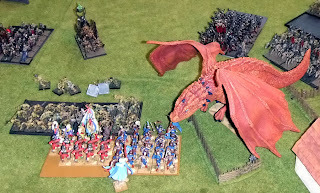 Elsewhere weight of numbers was beginning to tell in favour of the undead, although too late to do much else my general dispatched the Varghulf and headed for the centre of battle. 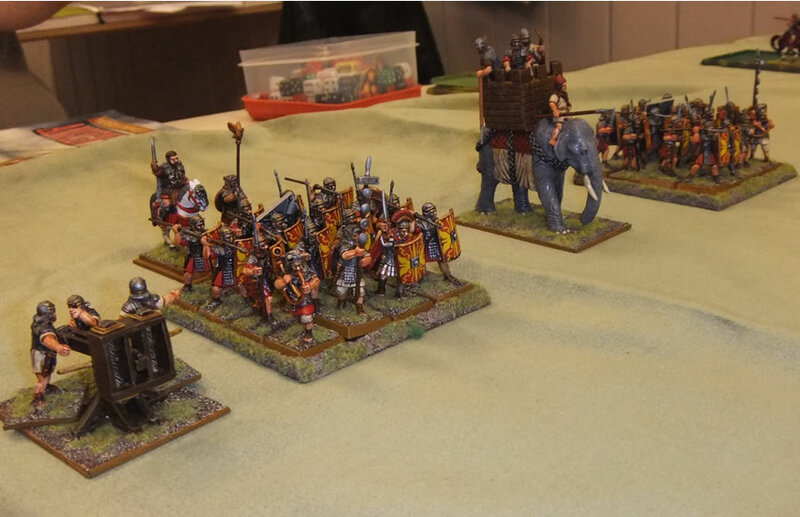 By now the rest of my cavalry had disappeared, save for Voland and a single unit of Centaurs. Even Halflings were in the thick of battle. 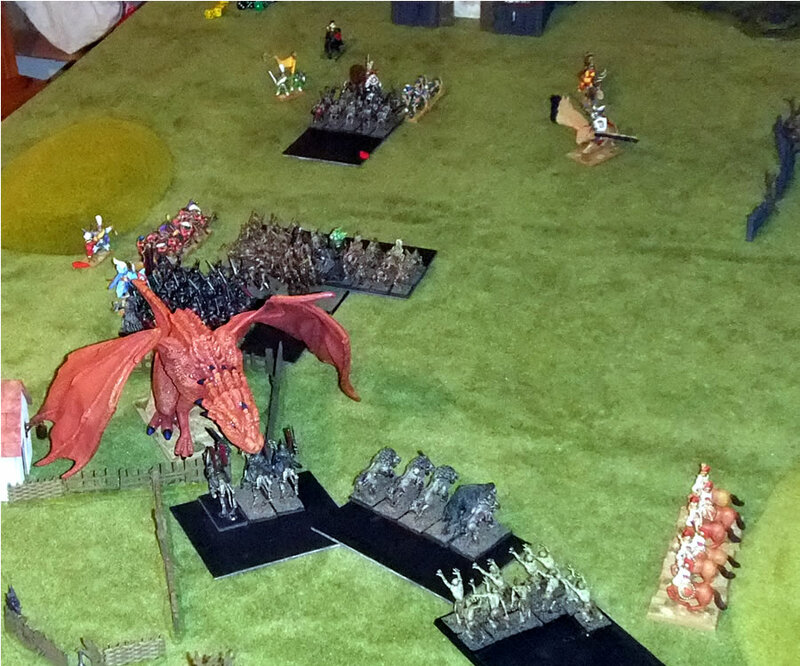 Late in the day, scattered remnants of my units fled the mass of undead, and Deathfang finally fell to a charge by the Grave guard. Dawn arose and all seemed lost! But, ah you see. 8th Edition would have it different. On checking the points values in what looked like a pretty clear cut undead win, it turned out that the dogs had won! As Jasons' units had been destroyed to a man they were worth victory points to me, conversely many of the units he had defeated had survivors scattered across the battlefield, and so were of no value to him. 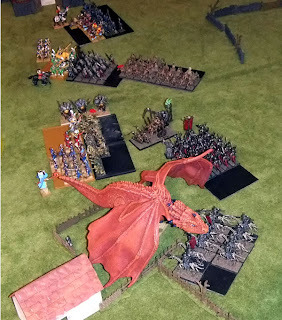 In the end I lost some 1450 points, of which a third was Asarnil and Deathfang. Jason lost more like 1650 and so by the present rules I won! Seldom has a flaw in the rules been so obvious! Still as the Dogs of War you have to take what you can get. 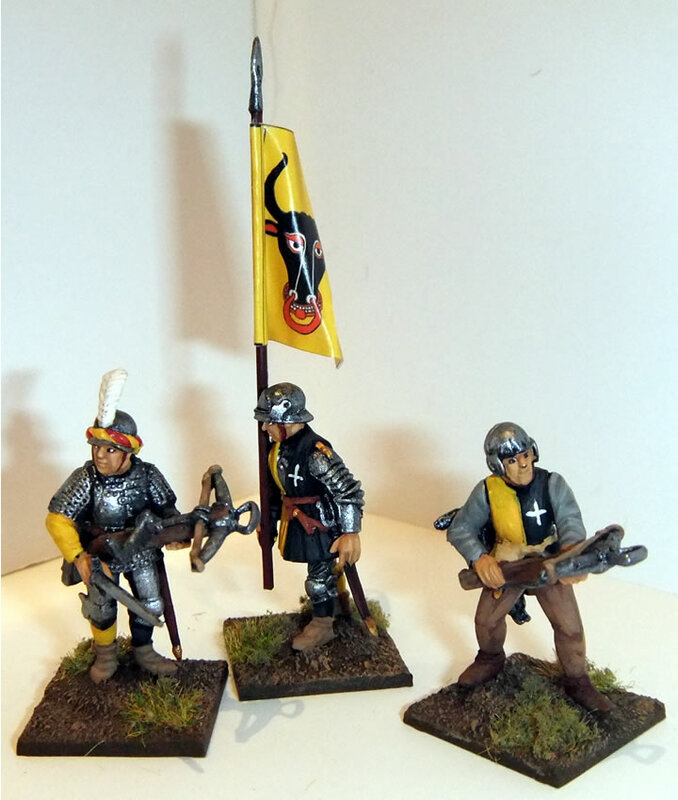 The Eierkuchen Konditorei are a new unit to my Dogs of War army, being comprised of Faeries (Wood Elves to the insistent of keeping it in GW fluff) from the dark woods of the Empire serving as duellists. The models are from Wargames Foundry's Elven range, picked up from a show vendor for £1 per figure, as slight seconds presumably; they needed a lot of work to clean up the flash and were a little pitted. Foundry prides itself on quality generally and so these models would not normally make it to a blister pack. I wanted a feminine, diaphanous appearance to the models and so went with a very light blue over a very pale flesh tone. The results are very natural, and I think very nice, only the Heroine got slightly different handling, as you can see. The recent limited edition Space Hulk terminators are awesome sculpts, but my word they took some time to paint properly, which after all was what the buyer paid for! 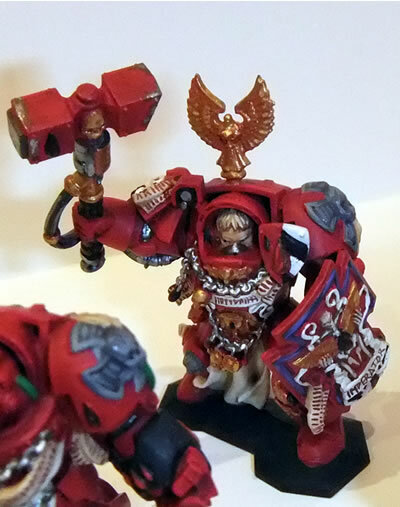 I got a nice rich red consistently across all the models and made sure all those fiddly little details were covered. 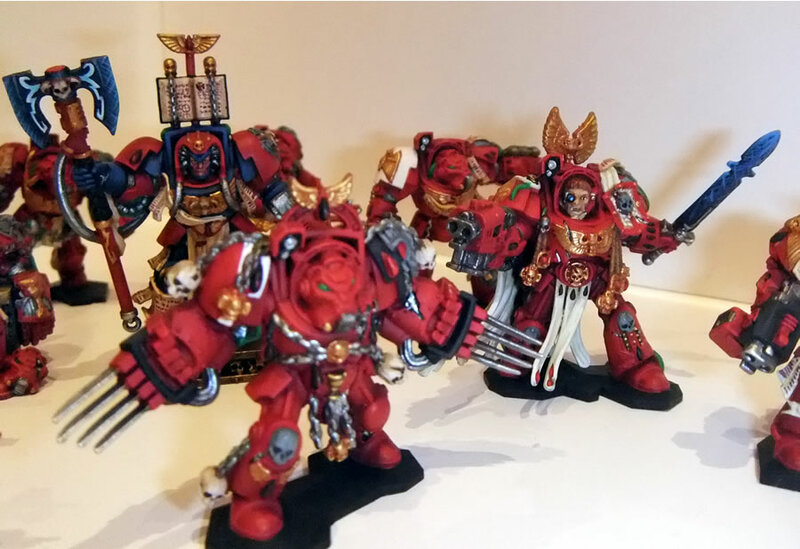 The centrepieces to the group are the Terminator Librarian and the dead Marine resting on his laurels (well, in a chair). There's plenty of variety in the poses, which seem to loosely form two squads of five, with the addition of a close combat specialist as shown above. 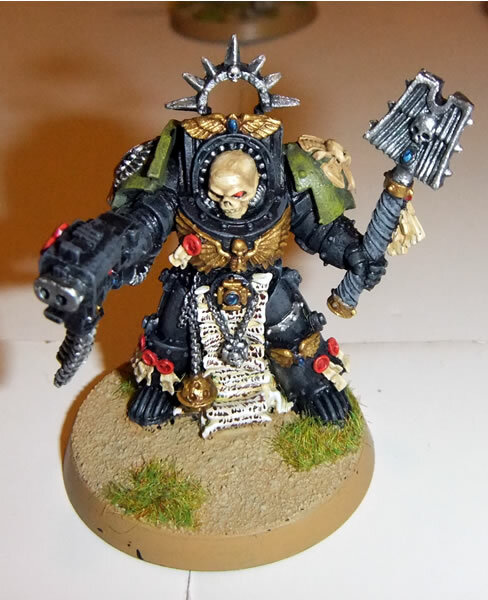 All those chains, skulls and bronze eagles made the job very time consuming. 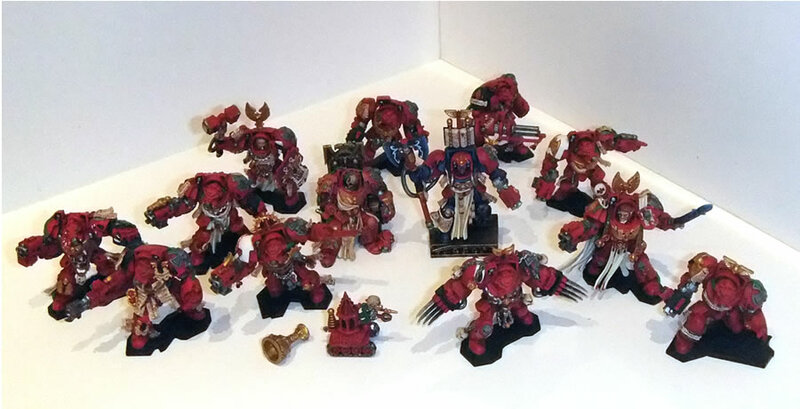 I've left the basing as simple as possible, I've no idea whether the buyer wants to use the models for the board game alone, or for 40k as well. 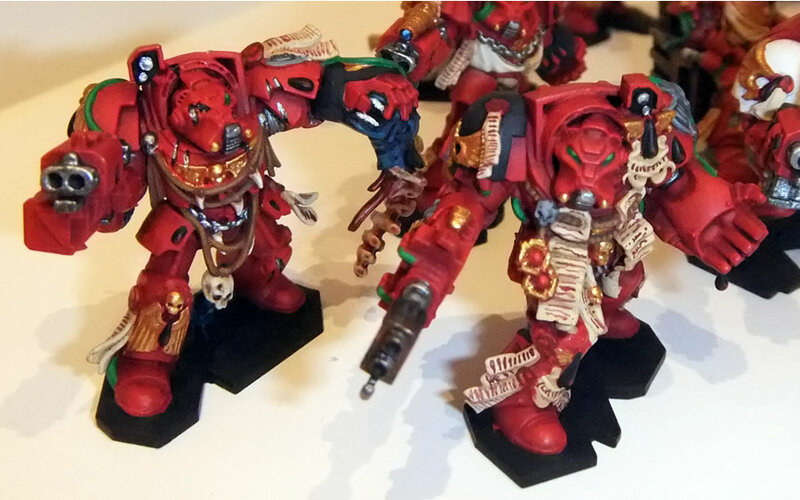 Still hopefully he'll be happy with them; I think they look great in the flesh, but after two months I'm glad to see the back of them. Twice as many as last month. No indication of a release date yet, but given how much I've enjoyed playing Black Powder in the last year, I have great hopes for this replacing Warhammer Ancients as my go to set of rule for battles in the pre-gunpowder age. 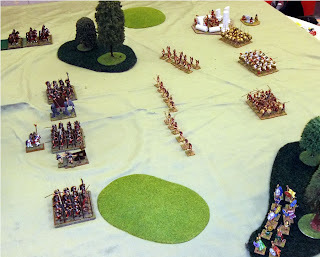 Ah, something Historical; it's been a while, and so it was great to play something without the intrusion of wizards! Spring, 1862 and in the quiet mid-western valley of the Waranoq river Colonel Hawkins thought he had little to concern himself with at the strategically important but largely silent Rumford Ferry crossing. His forces were limited, but deemed sufficient; 4 companies of the 19th Massachussets Regiment, a Pair of Parrot cannon and a troop of the Wisconsin Rangers. As dawn rose, one company held piquet duty at the ferry crossing whilst the Rangers were out on forage duty and the gunners prepared their guns. All seemed like it would be every day for the last few months. Indeed, a small brigade of Confederate troops, under the command of Brigadier Emmet Theosiphus Ingrams had arrived in the area, with orders to seize the crossing, and Ingrams had indeed used his most able scouts to steal away the ferry. And in doing so the men had determined the water level and flow of the river was gentle enough to allow men to cross on foot as well. With two Regiments of South Carolinan Infantry and a Squardron of a notorious Cavalry unit known as the South Carolina Tigers, Ingrams made a swift advance covered by darkness and woodland, arriving at the river at first light. They quickly embarked a company of infantry onto the ferry, whilst another company led the crossing of the river, wading out into the icy spring melt waters. Hawkins hurried to raise the rest of his troops from their slumber whilst the piquet under Witherspoon held its ground as best it could. Their steady rifle fire proved out of effective range, but was enough to sow confusion in the Confederate on the Ferry, who withdrew in some confusion. Still there was little they could do to stop the drenched, but aggressive South Carolinans under Ingrams junior commander, Easterman. Or the similarly enthused Tigers. 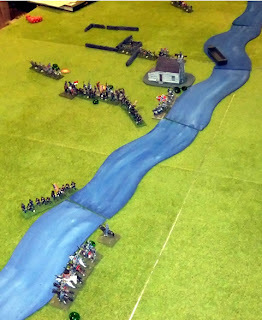 Still, the Tigers found themselves outgunned by the recently roused Union infantry. and were soon forced back accross the river. 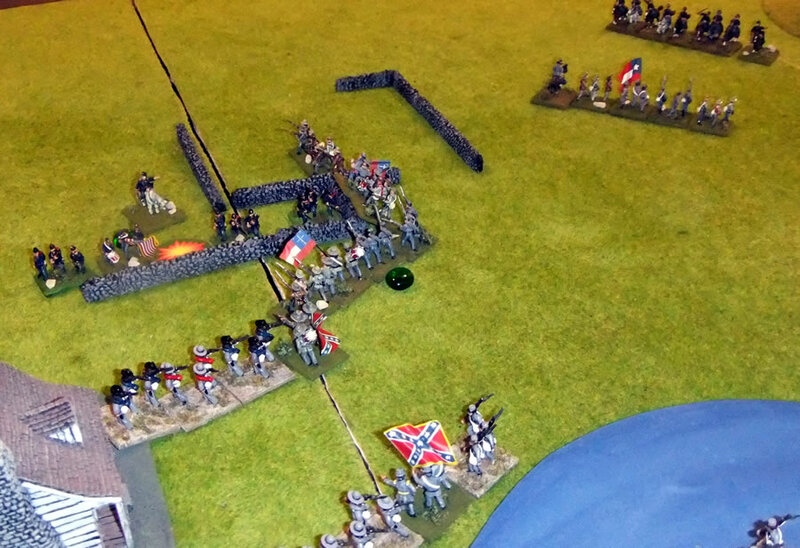 The 4th Southern Carolinans meanwhile began to encircle the increasingly beleaguered skirmisher of Witherspoons 2nd company. The Ferry was now covered from fire and Ingrams troops began to cross the river with dry boots and more importantly, powder. 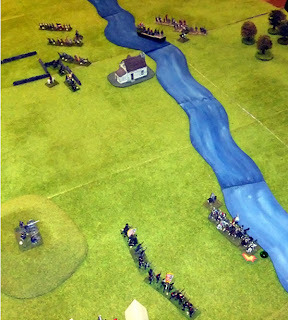 At this point the Wisconsin Rangers returned to the field, and began a hell-for-leather charge on a company of the South Carolinans. But the Carolinans were able to meet the charge, not the Northern cavalry's strong suit. 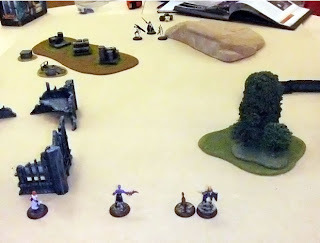 And although suffering a few casualties, with the leadership of Easterman, a rebel yell and cold steel they were able to drive off the Rangers. 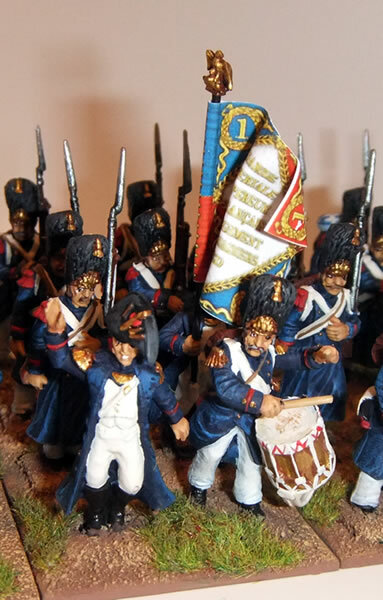 By now the piquet under Witherspoon had been dispersed, faced as it was by entire regiment. But it had allowed enough time for Hawkins to bring up the guns and two companies of the 19th Mass. 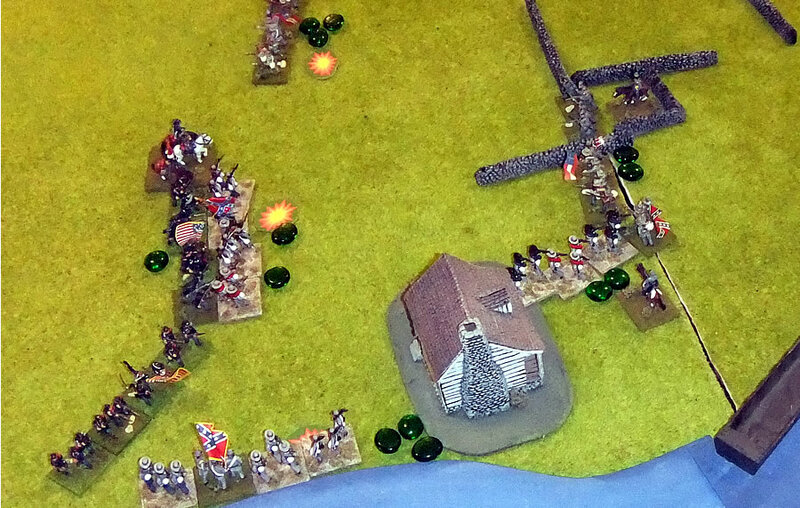 These formed a defensive line, and were able to put superior fire into the Rebels. 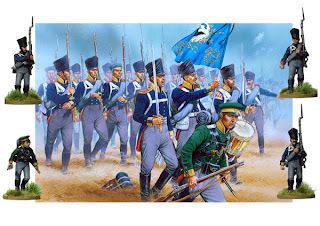 The Carolinans charged the guns, with a degree of overconfidence that actually proved well founded; the guns did their work, but not quickly or brutally enough and were caught and destroyed. Bouyed up by this the centre of the Rebel lines also charged. 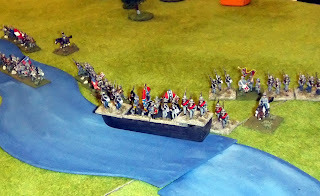 At the same point the Carolina Rangers, who had spent around an hour South of the River rallying their numbers, turned and made their way accross the river again. 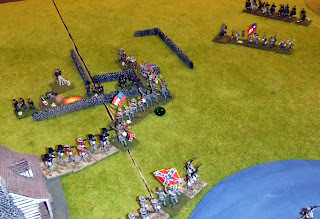 the isolated third company of the Union infantry tried to hold their attack, as their friends tried to stay the Rebel infantry, but for Hawkins the tide was turning against him. In the centre a bloody melee left both companies engaged in an appaling state, no longer fit as fighting units, but this only served to leave one Union company to face a regiment and a half of Confederate troops. Seeing the Tigers put the Laconic 3rd Company to flight to his rear, Hawkins was only too ready to accept terms of surrender when offered by Ingrams, at a little after ten in the morning. Union losses amounted to 34 dead and 85 wounded, mostly in the centre, with some 130 fit men also taken prisoner out of an initial force of some 700. Confederate losses amounted to 27 dead and 63 wounded; which secured the key crossing for relatively light losses (from a force of just over 1200 men) and also garnered them a valuable supplty of arms and equipment. Not to mention another medal for Ingrams increasingly gaudy uniform. 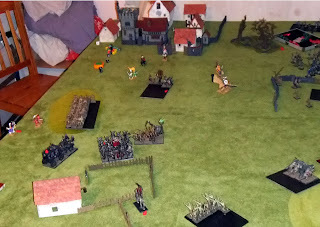 a quick Black Powder game, which took me and Martin about 90 minutes to play through. In terms of special features, the ferry could put one company per turn across the river, and was assumed to be ready to do the same again on the next turn. 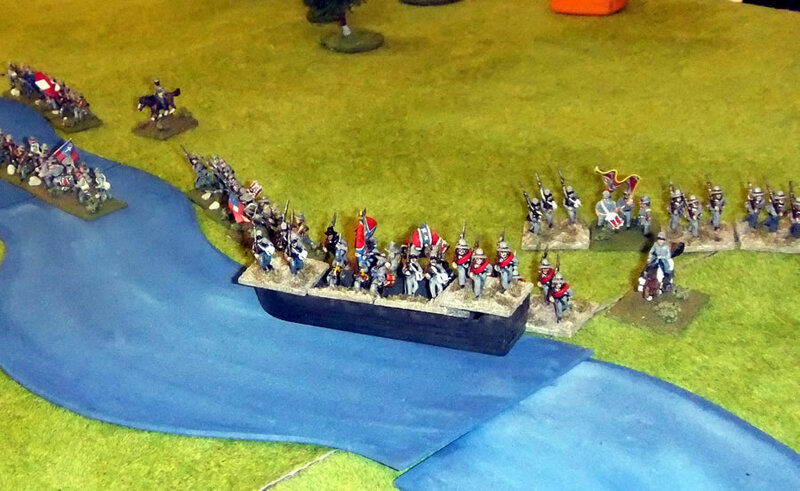 Crossing the river on foot incurred a -1 penalty to all shooting for the rest of the game. The three Union companies in the camp were assumed to be asleep; their general had to issue wake up orders, which got one base out and ready for action for each success, no Brigade orders were permitted for this. This mean't that it took at least two turns for a company to be fully ready to move, though if attacked they could defend themselves in-situ at a depleted level of ability. 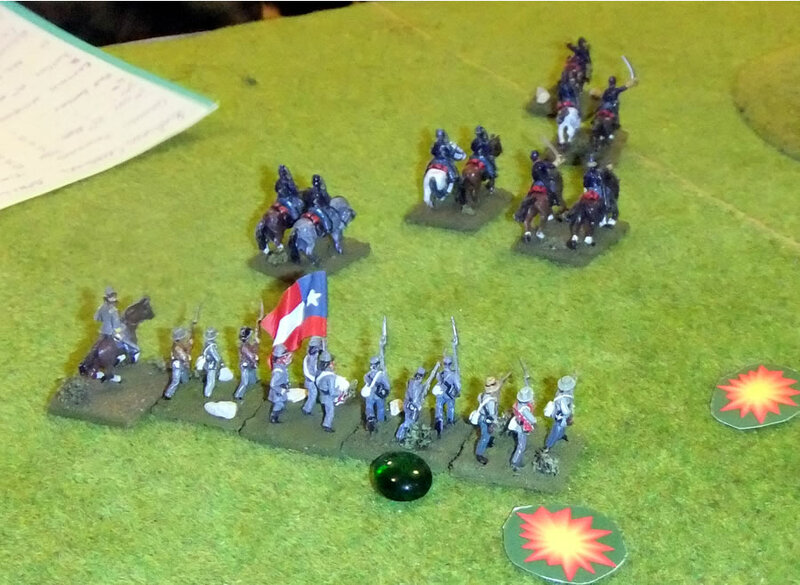 The Union cavalry arrived on their turn 5. A nice little challenge; as it was I think the dice did much to beat Martin (usually my excuse). That of course means I won!